The ground floor of this family home in Essex has been completely revamped thanks to Nic Antony Architects. 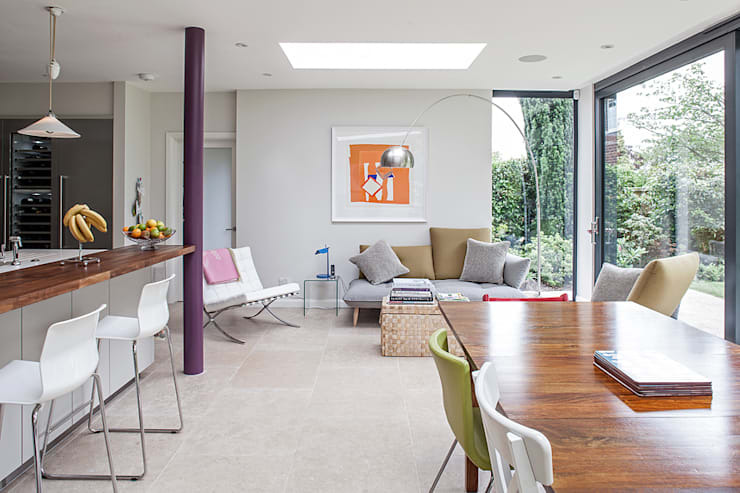 The London-based architects added a rear and side extension to create a stunning open-plan family room, with a modern kitchen, dining area and stylish yet comfy living space. 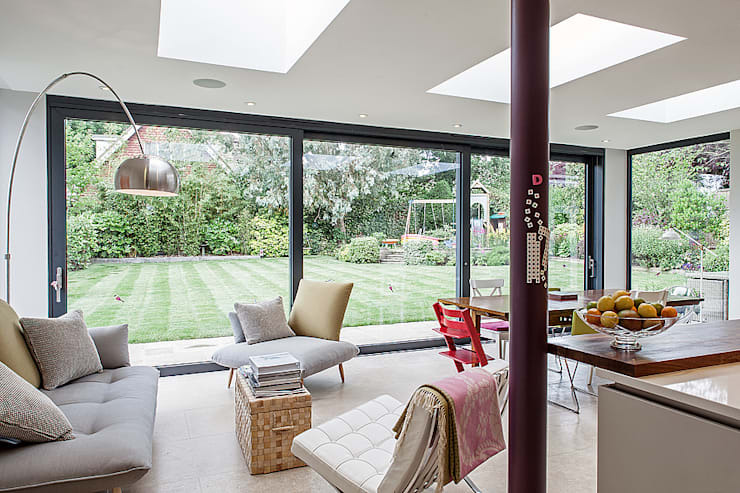 The floor-to-ceiling glass windows and sliding patio doors establish continuity between outside and in, allowing the garden to become a focal feature of the home. First impressions are important, and the one inspired by this 1930s exterior is certainly favourable. The façade has been freshly painted, with a dark charcoal grey shade emphasising the detailing below the window and on top of the porch roof. The paved driveway looks particularly attractive, with patterns forming on the ground as sunlight hits the trees. 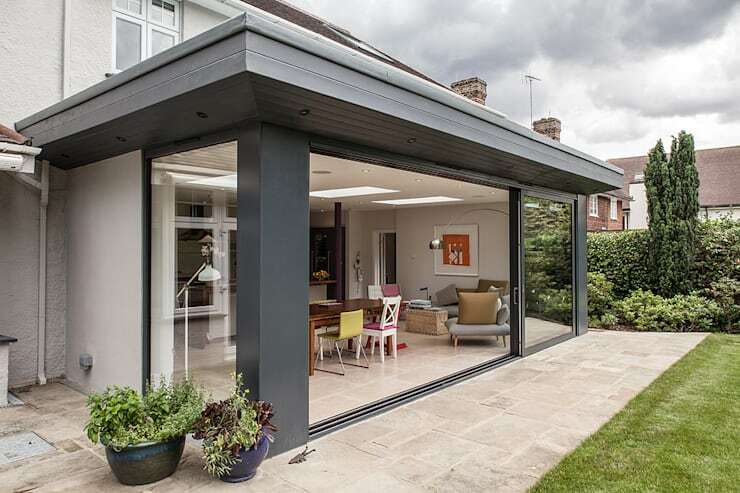 Here we see the rear extension with the sliding doors fully retracted, allowing indoor and outdoor spaces to merge. The choice of tiles for inside the home complements the light stone slabs, which form the patio area, further establishing a continuity between inside and out. From one of the comfy seats in the living area, or as you enjoy a leisurely evening meal at the dining table, you can always enjoy a pleasant view out to the garden. The perfectly manicured lawn, pruned bushes and neat borders of shrubs are the perfect match to the spotless and modern interior. The glass doors give easy access to the outdoor space, which is perfect for hosting parties during the summer. Furthermore, they also flood the lower floor with plenty of natural light. The neutral colour scheme and sleek white cabinets give this kitchen a modern feel, which is further enhanced by the futuristic kitchen lighting. The three hanging lamps directly above the matte-white kitchen island draw our attention to the symmetry of the design. From this angle, we can appreciate how the line of sight has been considered, with clean lines and discreetly integrated appliances working together for a seamless effect. With the addition of spotlights and skylights, this kitchen is in no short supply of natural light. The overall vibe is refreshing thanks to the stress-free layout and cool, soothing tones used throughout. 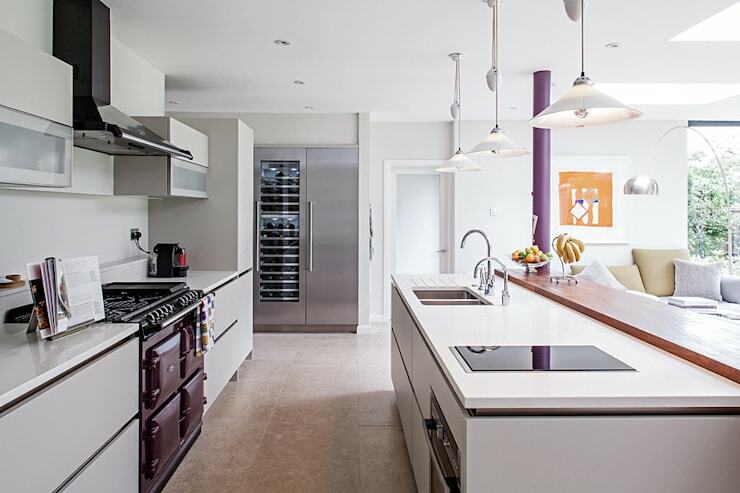 Our favourite thing about this modern kitchen is the splash of purple, which breaks up the monochromatic scheme. The traditional AGA cooker stands out against a sea of white cabinetry and an industrial style structural pole recognises the border between the kitchen and dining area. The large stainless steel fridge has been integrated into the wall and comes complete with a stylish wine cooler. The space has been divided into three distinct sections: kitchen, dining space and living area. The cosy corner we can see here is the perfect spot to unwind with a cup of tea and a magazine. 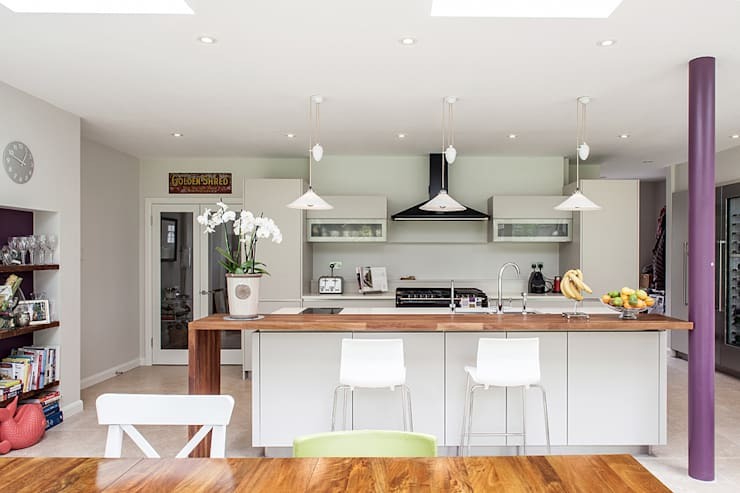 The open-plan layout provides the opportunity for the family members to interact with ease. Whilst one person cooks, another can relax (though it's likely the chef might want to take it in turns!). The furniture in the living area complements the edgy, modern look of the kitchen and dining area, with a few subtle pops of colour to really bring it to life. 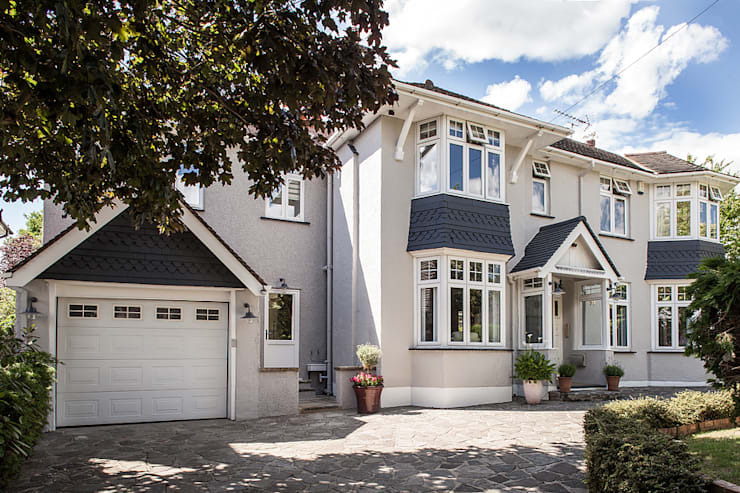 To take a tour of another beautiful British home, check out: House with a great backside.